Like many state mottoes, the Iowa motto was adopted as an element of its state seal. Iowa officially entered the Union on December 28, 1846. During the new state's First General Assembly, in 1847, legislation was passed to designate an official state seal to authenticate official state papers. The motto, Our Liberties We Prize and Our Rights We Will Maintain, was determined by a three-member committee of the Iowa Senate. They suggested the motto and its placement on the official state seal. The Great Seal of Iowa and, with it, the state motto, Our Liberties We Prize and Our Rights We Will Maintain was adopted by the First General Assembly on February 25, 1847. It's considered that this motto is at least partially in response to the difficulties that Iowa ran into establishing statehood. The motto makes the clear statement that the liberties of the Iowa citizenry are very important and that they are willing to defend them. Our Liberties We Prize and Our Rights We Will Maintain is also displayed on Iowa's flag. Like many states, Iowa's state motto was adopted as an element of its official seal. Unlike other state statutes however, the motto is noted in the section title. The following information is excerpted from the Iowa Code , Title 1, Subtitle 1, Chapter 1A, Section 1A-1. TITLE I. STATE SOVEREIGNTY AND MANAGEMENT. CHAPTER 1A. GREAT SEAL OF IOWA. 1A.1 Seal - device - motto. The secretary of state be, and is, hereby authorized to procure a seal which shall be the great seal of the state of Iowa, two inches in diameter, upon which shall be engraved the following device, surrounded by the words, "The Great Seal of the State of Iowa" - a sheaf and field of standing wheat, with a sickle and other farming utensils, on the left side near the bottom; a lead furnace and pile of pig lead on the right side; the citizen soldier, with a plow in his rear, supporting the American flag and liberty cap with his right hand, and his gun with his left, in the center and near the bottom; the Mississippi river in the rear of the whole, with the steamer Iowa under way; an eagle near the upper edge, holding in his beak a scroll, with the following inscription upon it: Our liberties we prize, and our rights we will maintain. Editor's Note: The Act of the First General Assembly of the State of Iowa creating the Great Seal, approved February 25, 1847, is hereby reproduced in the descriptive part. There seem to be no further enactments, repeals or amendments and no codification of this law appears in the various Codes. See Annals of Iowa, Volume XI, pages 561, 576. Constitutional provision for a great seal is contained in Article IV, section 20 but no description is there provided. State Motto List: List of all of the state mottoes. 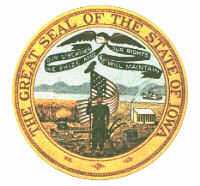 Great Seal of Iowa: Further information about the Great Seal of Iowa and its adoption.